Staffers of Kitano district tourism office and Yuto Masumoto of Osaka University help me find my grandparents' home. "We think that's where they lived, but it looks like that place is now a parking lot." Continued from Stuttgart shorts; Slow boat to Japan; Deutsche Schule shorts. A couple of months ago, when I found the notice in the U.S. soldiers' newspaper Stars and Stripes, offering the property of "P. Schmitz" for lease and giving its location, I thought I'd finally found a crucial clue to the location of my grandparents' home in Kobe, Japan. 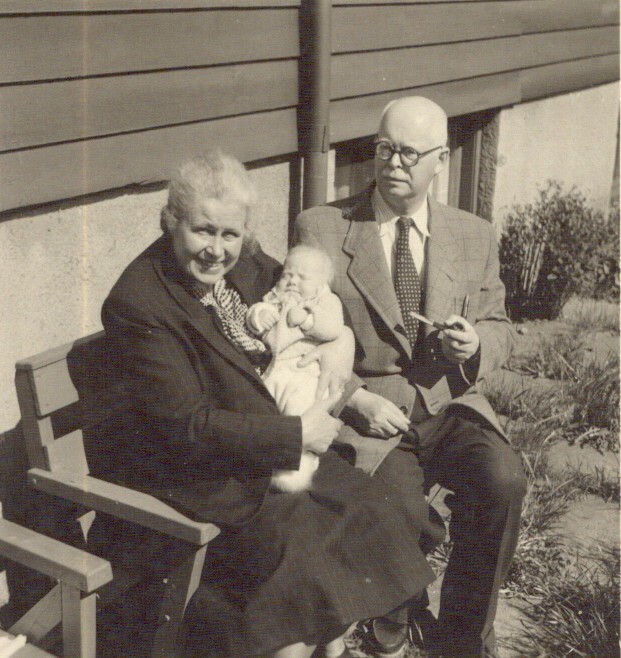 It made sense: I knew that my grandparents, Paul and Emma Schmitz, and my mother had been deported to Germany on an American ship in 1948; and my mother had always told me that their property was confiscated for American military use. The newspaper announcement appeared in May 1949. When we went off to Japan last month, I took the Stars and Stripes information with me, assuming it referred to their home. 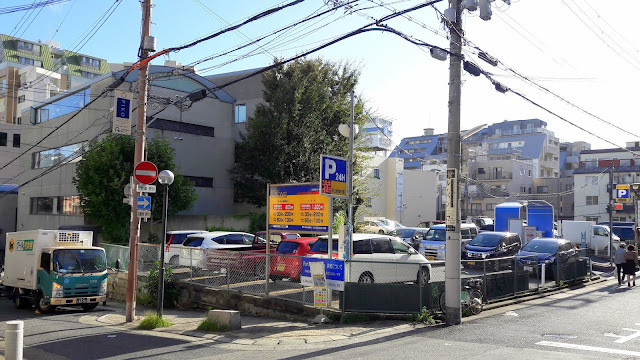 Eight days ago, we went to Kobe to visit the current incarnation of my mother's school. Three days later -- last Saturday -- we went back to Kobe for most of the day, in search of my grandparents' home. 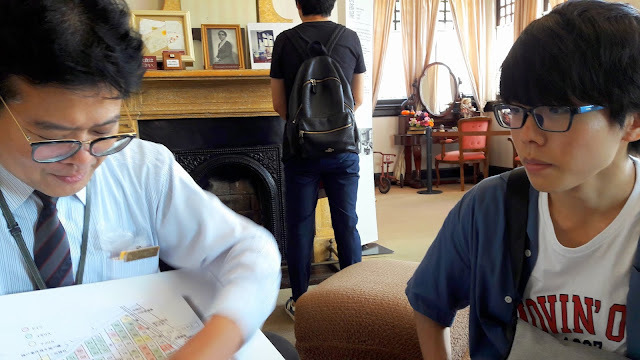 With us we had a valuable co-researcher, Osaka University student Yuto Masumoto, who is studying Russian and who had offered to help us in our quest. 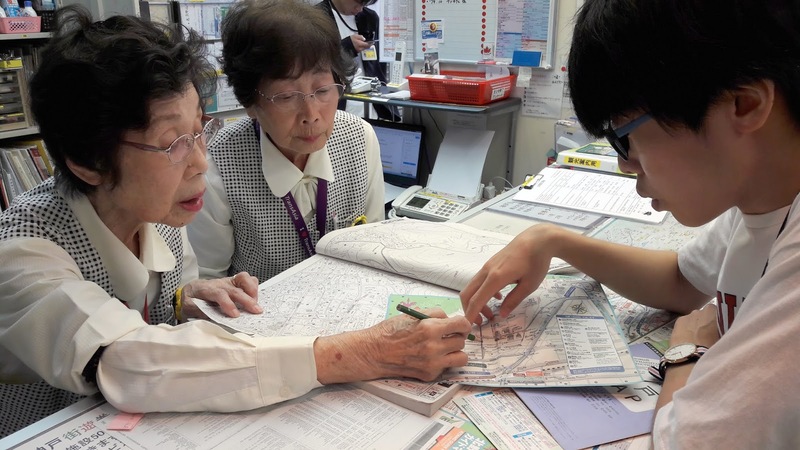 Yuto was a godsend, helping us find the places and people we needed, and serving as an interpreter. In return, we gave him some Russian coaching and promised to stay in touch and send additional language resources. Our time with him was a great delight. Many of the grander houses owned by Kobe's prominent foreign residents were in the Kitano district, so that district's tourist information office was our first stop. Two of the office's staff members took the Stars and Stripes information I brought and referenced it to their huge books of maps. Their conclusion: the address I gave them was a summer house up in the hills, not the family's city home. Did I have any other information that would help them find that city home? A slice of the document I'd been avoiding. There in the "last address recorded" column for party member # 3444593 was a street corner just ten minutes' walk away from where we were. "We think that's where they lived," the kind staffer told me, making a circle on the map, "but it looks like that place is now a parking lot." That Nazi party list had other nuggets of information for me. At long last I had a birthplace and birthdate for my grandfather, which I hope will help me find out more about his life and his ancestors. But here's the item that really pulled me up short: if the records are accurate, he was a party member from the early years of the Hitler regime -- starting April 1, 1934. In my growing-up years I'd vaguely heard that he had joined the Nazi party, and also heard an explanation for his membership -- that it was obligatory for a member of the small business community among the Germans in Japan (and that my grandmother Emma refused to join). However, I'd never had such a direct confrontation with the cold facts of his Nazi membership. Emma and Paul (and me) in Oslo. My memories of Paul Schmitz are uniformly positive. Among other things, he is the one who gave me a copy of William L. Shirer's The Rise and Fall of the Third Reich, the first serious book I ever read about Hitler and the Second World War. Still, I now have a few questions I wish I'd known to ask. I also wonder what the conversations were like between him and my father's parents. I know they met; I have a photo of my German grandparents at my Norwegian grandparents' home in Oslo. Did my father's father talk about his service in the Norwegian resistance army, reporting to London on the movements of German ships, and helping smuggle people across the Swedish border? There are just some gaps that documents by themselves won't fill in. Those were a few of my thoughts as we walked to the parking lot indicated on our map. I stood among the expensive cars and thought to myself, "This might be the neighborhood where my mom grew up." 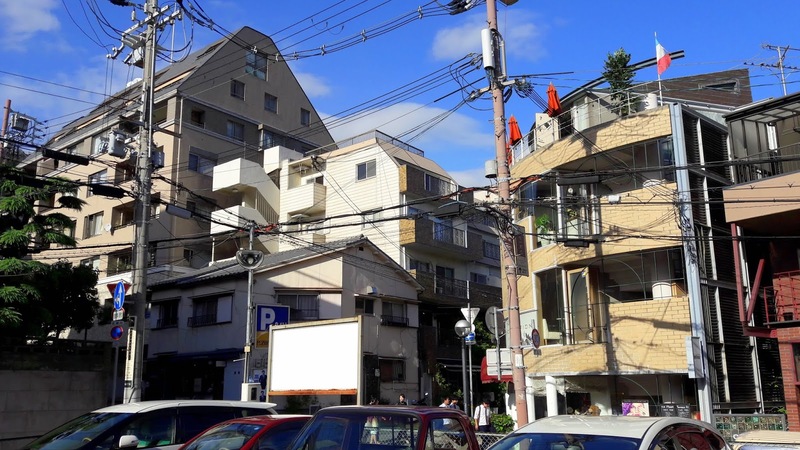 None of the buildings in the neighborhood looked as if they'd been built before World War Two. After all, what that war didn't destroy could have been leveled by the 1995 earthquake. I was going to have to be satisfied with walking the narrow streets of my mother's childhood ... and I was. and his family lived here; we felt sure that my grandparents would have been part of the social life in this house. 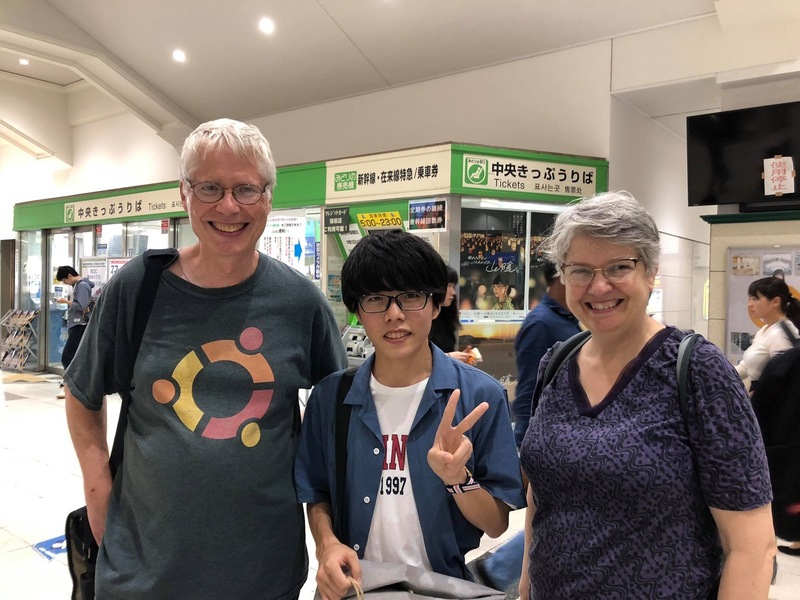 We say goodbye to Yuto Masumoto at Kobe's Sannomiya Station. A finale of sorts: Slow boat to Japan (PS). Choose your George Soros: is he a rich Jewish investor (choose a well-worn anti-semitic meme) or a favorite atheist straw man (insert favorite anti-Zionist meme)? The ecumenical patriarch grants independence to the Ukrainian Orthodox Church. RFE/RL's comparatively even-handed coverage; various Russian-language voices. Oscar Romero is to be canonized this Sunday. Also: setting the record straight on how Oscar Romero's faith was transformed. How the Goblin is redefining the solar system. Frida Berrigan thinks about cheetahs, and the inheritance of children. One of the commenters: "This is the most original rendition of The Sky Is Crying that I've ever heard." I agree.